After lots of itty-bitty efforts and little progress, I’ve decided to set up a regular writing group for mothers who want to improve their emotional well-being. And eat lovely soup. Aphabet Soup was born last night. I have been a member of Mewe for over a year. We’re a friendly bunch of people helping each other combine art and creativity with mothering. And in our regular meetings we listen to each other’s struggles and triumphs wholeheartedly. Meeting even once a month has done wonders for both my mental health and urge to create. Getting ready to go to my Mewe meeting last night, I thought, wouldn’t it be amazing to regularly spend a couple of hours writing among friends? And then eat a lovely home-cooked meal with them? 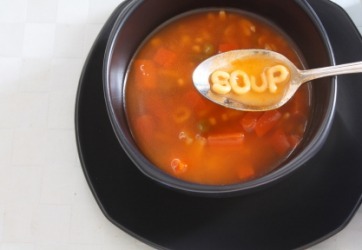 And that’s how the idea of Alphabet Soup was born. At this stage in my life, I can’t afford an Arvon course or even an occasional writing workshop – although I do dream (often). And I know that one day I will…. I do, however, need that energy that comes when you write with other people: the comradeship as you struggle through the blocks together and the highs when you lose who you are and become just the writing. I love the new creative journeys that writing in a group can take you on and I know that the regular commitment to write together will promote my own discipline too. In time I want to connect with others interested in the interplay of arts and therapy – writing especially. There are some amazing projects out there. But, with my children-around-my-ankles-blinkers on, this is where I need to be right now. If you live in the Upper Calder Valley – and can travel to Todmorden, Hebden Bridge, Rochdale, Halifax or even Leeds – then you’d be very welcome to come along. Donations of soup and a willingness to explore is all that is needed! Contact me for more details. would you pass a post natal depression assessment?